This course, approved by the Health and Safety Executive, is particularly good for people in environments where there is a lower risk of emergency, either due to the nature of the work or number of employees, or where qualified medial assistance is close at hand. The emergency first aid at work course provides the basic knowledge required to respond quickly should an emergency occur. The HSE have produced a leaflet on emergency first aid at work which you may find useful please click HERE. This will open up a new window. Understand the basic principles of first aid. Understand the priorities of a response. Know how to deal confidently with an emergency first aid situation. The role of the First Aider. 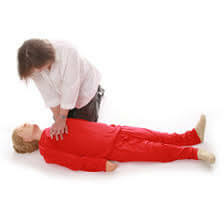 Practical emergency life saving skills; resuscitation, bleeding and choking. Practical first aid for minor injuries. Continual assessment by the approved tutor throughout the day, with feedback and guidance offered to increase confidence and awareness. The certificate is valid for three years during, which annual half day ‘updates’ are recommended. At the end of three years this one day course is taken again.